We woke to a calm morning with clear skies and a light breeze. 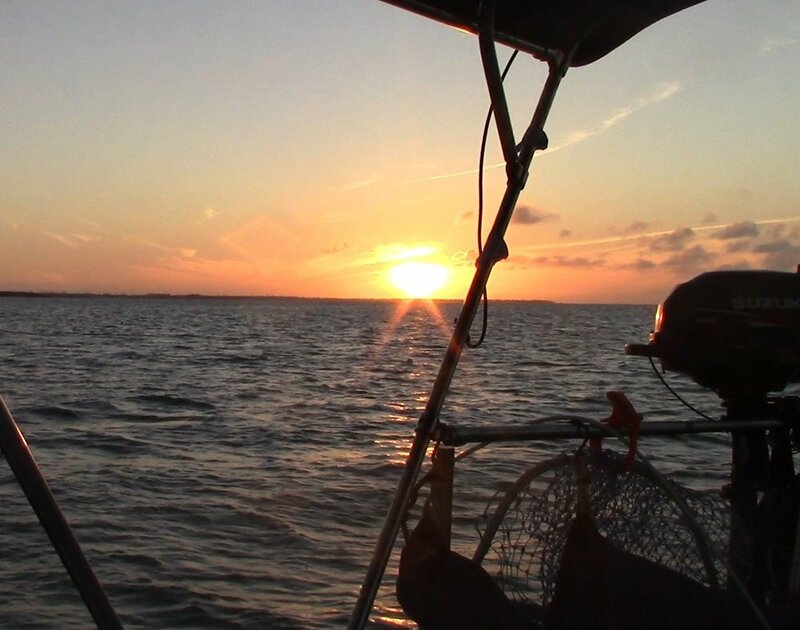 Our plan was to sail out into Florida bay and spend one more night in the back-country anchored off the coast of Sandy key, a tiny strip of land a few miles south of Flamingo. Once out in the Gulf, the wind picked up, but other than having to weave between the thousands of crab traps that lined the coast, the going was pretty smooth. Unfortunately, as the day progressed the winds climbed to 20-25 knots from the southeast with short close-set waves. The biggest problem in this development wasn't the change in water conditions, but the fact that the southeast happened to be the exact direction that we were trying to travel. 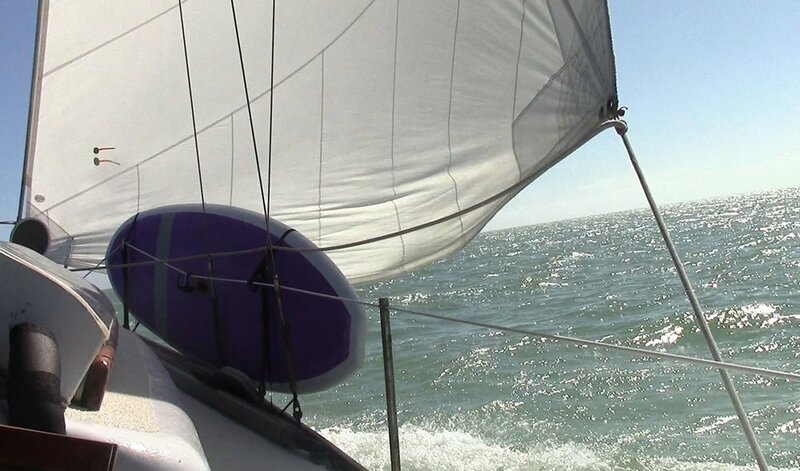 If you are unfamiliar with sailing, then you should learn that upwind sailing is the worst. There aren't a lot of great options left to you as a sailor in this situation that won't greatly inconvenience you. In our case, we did our best to skirt the edge of the wind, going only slightly off course, and attempted to make up for the lost speed by motor sailing. This meant, that not only were we sailing off-course and at a slower pace than we would like, but the route quickly became obnoxiously uncomfortable, as the boat was forced to go directly against the waves and the wind. All the makings for an incredibly bumpy trip. While I was able to avoid seasickness, it was certainly the most uncomfortable sail we'd experienced yet. Thankfully, despite these issues, we made it to Sandy Key by mid-afternoon. The waters of Florida Bay were perfectly blue and shining brightly in the sun. After a hard morning sail we were both eager to settle in and stretch our legs. As its name implied the island was ringed with a beautiful white sandy beach; so white in fact that it almost disguised the thousands of white pelicans lining the waters edge. Even with the FWC boats patrolling the shores, the key looked wonderfully inviting. Sadly, the tides were not in our favor, as the strong winds and shallow waters surrounding the key made anchoring out not only an uncomfortable option but possibly a dangerous one as well. Since we were only 15 nautical miles away from Marathon, Matt and I decided it would be best to head for The Keys instead. I was deeply disappointed to sail by such a lovely looking place, but I couldn't say he was wrong. My disappointment was somewhat abated when I found out later that the key was not open to visitors in the winter months, since it is a major nesting ground for many Florida birds, like Roseatte Spoonbills and White Pelicans. Which would explain the marine patrol boats we noticed anchored off the beach. After briefly drooling over the key from afar, we set off for Marathon. On the plus side, we finally weren't heading directly into the wind and we were able to sail much more steadily and at greater speed. The ride was still bumpy, but we made incredible time. We decided to anchor out at an area called Long Point Key. This area came recommended to us through one of our guidebooks, which stated that it was one of the more isolated and quiet anchorages in Marathon. He wasn't wrong. The anchorage lied just beyond Curry Hammock State Park and was mostly surrounded by trees, ensuring that we were not kept up at night by loud traffic noise and lights. That being said, we did have one home near us. At the end of Long Point Key sat a gigantic mansion that took up the entire end of the point. Matt was told by a local dock hand that the opulent mansion belonged to a higher up with the Anheuser-Busch Brewing Company, but we haven't been able to verify this. Either way, the spot was calm, quiet and lovely, which was a nice break from what we had been experiencing at sea. While we arrived well before sunset, we were in no mood to do much else besides sleep and eat dinner. A beautiful sunset to welcome us to Marathon. A view from the boat. The mansion on Long Point Key. It supposedly belongs to someone that works with Anheuser-Busch. Doing my best to smile despite the bumpy ride.